Abdulhakim Muhammad was charged with killing Pvt. William Long, 23, and wounding Pvt. Quinton Ezeagwula, 18. (CNN) -- A man accused of shooting two soldiers at a military recruiting center in 2009 pleaded guilty Monday to the crime and received a sentence of life in prison without parole. 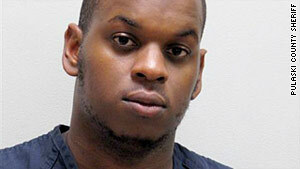 Abdulhakim Muhammad, formerly known as Carlos Bledsoe, was charged with killing Pvt. William Long, 23, and wounding Pvt. Quinton Ezeagwula, 18. The attack happened June 1, 2009, outside a recruiting center in Little Rock, Arkansas. Muhammad faced 12 charges in total -- capital murder, attempted capital murder and 10 counts of unlawful discharge of a firearm from a vehicle -- according to Stephanie Harris, a spokeswoman with the state court system. In Arkansas, defendants cannot plead guilty in a case in which the death penalty is a possibility. Prosecutors agreed to drop the death penalty in exchange for Muhammad's plea, Harris said. A Muslim convert from Memphis, Tennessee, Muhammad was 23 at the time of the fatal shooting. He was angry at the U.S. military because of "what they had done to Muslims in the past," Little Rock homicide Detective Tommy Hudson has said. CNN's Sara Pratley contributed to this report.